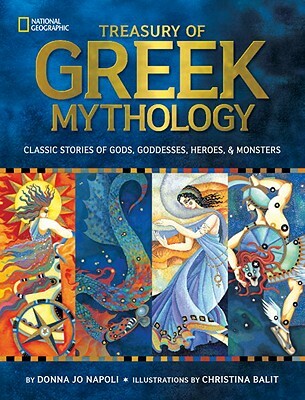 I confess: I am slightly obsessed with books on Greek mythology. I don’t remember how young I was when I first began to read them — so, probably since the day I could read. I devoured every picture book, prose text, dictionary, encyclopedia, textbook, art book, you name it, that I could find. After a while, when I realized that the same stories were just being repeated over and over again, I stopped buying Greek mythology books for their literary content and started buying them for their artwork instead. Thus, it was the brilliant, bright cover of Treasury of Greek Mythology that first caught my eye. “Oooh, pretty!” I thought. Another art book to leisurely page through and drool over. My first impression was not incorrect — just incomplete. Balit’s artwork is stunning. Each chapter is preceded by a full two-page spread of the Deity or hero being featured. Balit skillfully works the various attributes and icons of the Deity in question into the splash page; you can learn a lot about that God or Goddess just by studying the picture. For instance, the Poseidon page shows that God in a chariot-ship being pulled by gigantic green, gold and red seahorses; the waters through which they swim merge with the greenish-blue globe of Neptune in the background. Poseidon holds a trident in one hand, with another trident painted onto the prow of his chariot-ship. Similarly, the splash pages for Hades show that God — garbed in brilliant red and orange, stoic expression on His face — standing on the surface of Pluto, a Great gate stands behind him; above, Charon guides a small ship passed the moon of the same name, carrying the souls of the dead. A lot of imagination and a heck of a lot of work went into creating those images, and the rest of the artwork for the book. So, bottom line: beautifully-written, beautifully-illustrated, worth every penny. No fan of Greek mythology, no Hellenistai, should be without it.